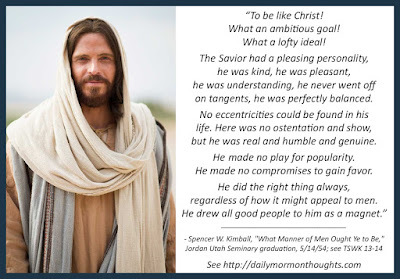 "To be like Christ! What an ambitious goal! What a lofty ideal! The Savior had a pleasing personality, he was kind, he was pleasant, he was understanding, he never went off on tangents, he was perfectly balanced. No eccentricities could be found in his life. Here was no ostentation and show, but he was real and humble and genuine. He made no play for popularity. He made no compromises to gain favor. He did the right thing always, regardless of how it might appeal to men. He drew all good people to him as a magnet. "To be like him, then, one must resist evil. One must fortify one's self by keeping away from temptation, out of the devil's area. One must control desire, harness passion, bridle every urge, and keep away from the approach of error. Total cleanliness in thought and action is required if one is to be Christlike. "'What manner of men ought ye to be?' The answer, 'Even as I am,' brings us to a realization that we must love our neighbor as ourselves.... [It] imposes itself upon us as a command to honor our parents, to be obedient to them, to love and cherish and sustain them and to glorify them with rich and abundant lives. We remember how, even while on the cross suffering the mortal agonies, he remembered and provided for his mother. "'What manner of men ought ye to be?' The answer, 'Even as I am,' reflects a studious life—a life of learning. 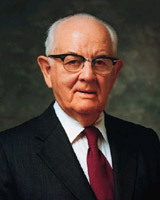 And he says: 'Search the scriptures; for in them ye think ye have eternal life: and they are they which testify of me.' (John 5:39.) "
President Kimball takes particular note of the Savior's challenging question and response: "What manner of men ought ye to be? Verily I say unto you, even as I am." (3 Ne 27:27) Answers include such foundational principles as service to others, prayer, and study. Labels: discipleship, example, Jesus Christ, Kimball Spencer W.